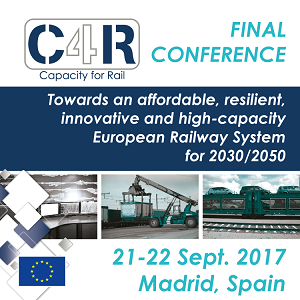 On behalf of the FP7 EU-funded project Capacity4Rail, UIC has the pleasure to invite you to the Final conference that will be hosted by FFE in the “Palacio Fernán Nuñez” in Madrid, Spain on 21-22 September 2017. Started in October 2013 and ending on 30 September 2017, the Capacity4Rail project is a 4-year collaborative R&D project co-funded by the European Commission within the FP7. Placed under the coordination of UIC, it brings together a wide range of stakeholders, in an ambitious partnership. 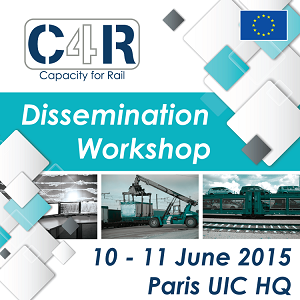 The Capacity4Rail (C4R) project aims at bringing today’s railway system to this future vision for 2030/2050. With this vision, Capacity4Rail main scope has been to offer an affordable increase of capacity, availability and performance to the railway system, by developing a holistic view on the railway as a system of interacting technical components driven by customer demand. A more efficient use of existing resources, by optimising operating strategies, enhancing traffic planning, improving transshipment procedures and improving automation and operational procedures to reduce the time needed to recover from traffic disruption. A reduction of the non-operational capacity-consumers, through the design of resilient, reliable and low-maintenance infrastructure and vehicles, non-intrusive inspection, fast renewal and construction processes. An increase of the performance of existing resources, through significant improvements of wagons maneuverability and equipment to answer freight customers’ needs for higher reliability and performance. New reliable slab-track solutions targeted to the actual and expected railway use and much lower maintenance. Innovative concepts for resilient Switches&Crossings and ground-breaking methods for Very High Speed. Upgrading of infrastructure in order to meet new operation and market demands. Innovations in wagons design, connectivity, terminal design and operations to meet the changing needs of the logistic market leading to the future freight train of 2030 and the vision for 2050. Step-changes for strategic, tactical and operational planning to meet future challenges such as increased capacity, optimized management of emergencies, enhanced information sharing and greater levels of connection between rail and the other transportation modes. Innovative concepts, based on innovative sensors, low-current technologies, energy harvesting for power supply and wireless networks, for railway structural and operational monitoring developed to enhance the availability of the track, combined with automated maintenance forecasts and a prediction of the structural lifetime. Technical and economical assessment of technologies developed, roadmaps and migration scenarios, necessary to meet the target affordable, adaptable, automated, resilient and high capacity railway system for 2030/ 2050.
o	Modelling and simulation of railway traffic? It will offer an excellent opportunity to hear about the latest developments in advanced tools for railway planning, simulation of railway operations, railway traffic management and innovative data architectures to enable the digitalisation of railway systems. Panel discussions with representatives of the main European railway industry and academia will be held in the context of the potential take up of these innovative solutions by the railways. Join us, it will be a fantastic time for looking at the future scenarios of railways in 2030/2050 and of course to boost networking. The event is open to anyone wishing to attend and will attract experts from across Europe’s rail infrastructure industry. in the context of potential take up of innovative solutions by the railway infrastructure industry. It will offer an excellent opportunity to hear about the latest developments in slab track, switches & crossings, predictive track maintenance, migration strategies for innovative track solutions 2030/2050 and provide a fantastic opportunity for networking. The workshop can accommodate 50 persons only and registrations will be accepted on a first come first served basis. As part of SP2 research, designing the rail freight system of the future, the CAPACITY4RAIL Consortium are conducting a comprehensive survey to understand the expected industry market up-take levels of our proposed designs, with regard to performance, operational, and technological characteristics. The survey is private and confidential, no respondents will be identified individually, and the results will be used in an anonymous manner. 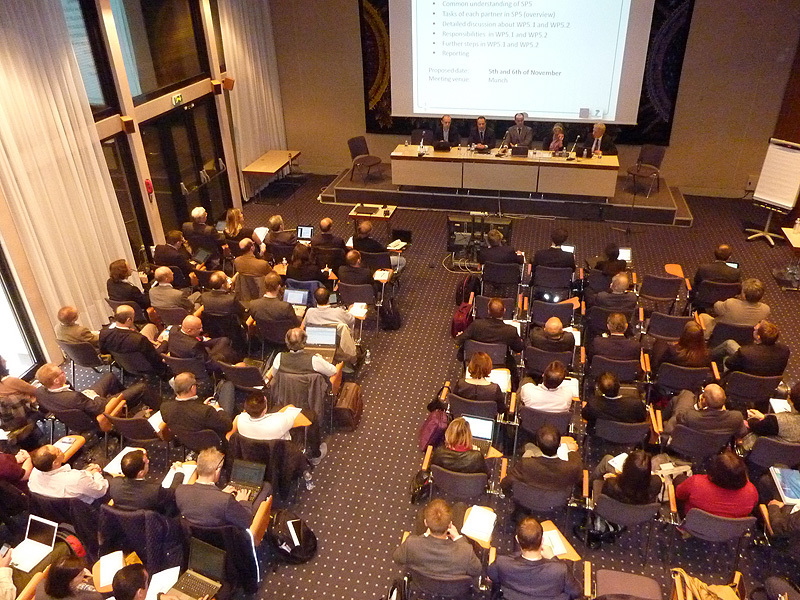 The results will inform a catalogue of rail freight systems to meet the requirements and expectations for 2030/2050. The catalogue will consolidate all the rail freight system designs developed and identify the technological innovation required to meet the White Paper goals. 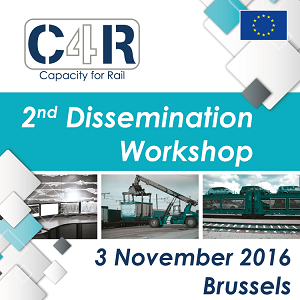 To be held on 3 November 2016, the second dissemination workshop will be the opportunity to promote the project’s achievements at 36 months of activity. We’re sorry, registration is closed! The Capacity4Rail project will be showcased from 20 to 22 September 2016 at InnoTrans 2016 (Oltis Group, Hall 4.1, Stand 312 and University of Birmigham, Hall 7.1c, Stand 305). Do not hesitate to visit the stands of OLTIS and University of Birmigham to learn more about the on-going research activities and attend live presentations of Capacity4Rail. See "Workshop 2015" for details and on-line registration. The Capacity4Rail project will be showcased from 23 to 26 September 2014 at InnoTrans 2014 (UNIFE Stand 302 in Hall 4.2). Do not hesitate to visit the UNIFE stand to learn more about the on-going research activities and objectives of Capacity4Rail. We look forward to seeing you at Stand 302 in Hall 4.2.